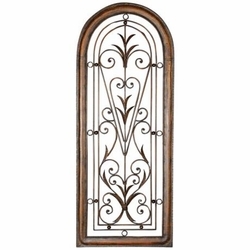 This petite Cristy wall art features a hand forged metal frame, scrolling designs, and an arched shape reminiscent of medieval windows. This elegant wall art piece adds a rich look to the Decor with scrolling designs encased by a hand forged metal frame. This piece is first given a light brown undercoat and then finished with a distressed dark brown wash for depth and beauty. Create elegance and stunning drama on your walls! • With two eyelets for hanging.